We’ve told you here before about some of the terrific collaborations Chicago-born harmonica player Bob Corritore has recorded in recent years, teaming with industry veterans such as Tail Dragger, Henry Gray, and John Primer, to name just a few. Though Corritore may have paired with someone slightly less known this time around in 27-year-old West Coast guitarist and singer Big Jon Atkinson, you’d never know it by listening House Party at Big Jon’s (Delta Groove Music), between Atkinson’s deep gravelly vocals that display a maturity decades beyond his years and the vintage equipment and techniques on which the album was recorded at, you guessed it, Big Jon’s home studio in San Diego. One of the most solid sets of blues laid down in recent years, House Party has a slick, old-school Chicago sound – the kind of stuff we’ve grown all too accustomed to hearing only from veteran blues acts such as John Primer and Tail Dragger in recent years – that harkens back to the likes of Elmore James, J.B. Hutto, and Howling Wolf, with the thick, opening “Goin’ Back to Tennessee”, for example, sounding like a cross of James’ “One Way Out” and Wolf’s “Evil”. From simmering numbers such as “It Wasn’t Easy”, to the lively, swinging “Mad About It”, and the “Christo Redemptor”-like instrumental “El Centro”, these guys prove time and again that they can really deliver. And that’s before we even get to talking about the impressive roster of guests who join them on the project, including senior bluesmen Tomcat Courtney and Willie Buck and baby boomers Dave Riley and Alabama Mike, who collectively only help add to the authenticity and diversity of the album. This includes Courtney on vocals and guitar for the slow, steady “Mojo in My Bread”, frequent Corritore collaborator Riley on vocals and guitar for the creeping gospel number “At the Meeting” and chugging “Mississippi Plow”, Buck on vocals for both a John Primer-ish “You Want Me to Trust You” and splendid “I’m a King Bee”, and Alabama Mike (who most of the world hasn’t heard nearly enough from, in our opinion) on vocals for the greasy “Mojo Hand” and a slow, burning cover of the Casey Bill Weldon/Louis Jordan classic “Somebody Done Changed the Lock on My Door”, with other highlights among the album’s 16 tracks including the swaying “She’s My Crazy Little Baby”, a plodding “I’m Gonna Miss You Like the Devil”, and the shuffling closer “My Feelings Won’t Be Hurt”. 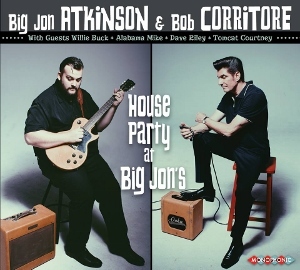 Produced by Corritore and Atkinson, House Party will be appealing to blues fans spanning at least as many generations as were represented by the musicians on this recording (with the youngest member having been in his late teens and the eldest – Courtney – in his mid-80s), and then some! This entry was posted in Albums and tagged Alabama Mike, Big Jon Atkinson, Bob Corritore, Dave Riley, Tomcat Courtney, Willie Buck. Bookmark the permalink.